At first it was just a Black Friday rumor, now it's official. Nintendo has announced that they will be launching a gold The Legend of Zelda themed Nintendo 3DS XL this November. The 3DS features a gold front and black exterior, and will feature the famous Triforce symbol. Also, the device will include a code for a downloadable version of The Legend of Zelda: A Link Between Worlds. This bundle will be available November 22nd for only $219.99. The Legend of Zelda: A Link Between Worlds will launch along side the 3DS XL, and will cost $40. Therefore if you purchase the bundle you will save a total of $20. "This beautifully designed Nintendo 3DS XL system continues a tradition that has delighted our fans for decades. It's a special bundle for a very special video game." said Scott Moffitt, Nintendo of America’s executive vice president of Sales & Marketing. The Legend of Zelda: A Link Between Worlds is more like a remake of The Legend of Zelda: A Link to the Past, since it takes place in the same Hyrule. One of the main new features is called 'Link' which allows you to transform into a drawing and move across walls. This feature will help you to solve puzzles and explore other areas. 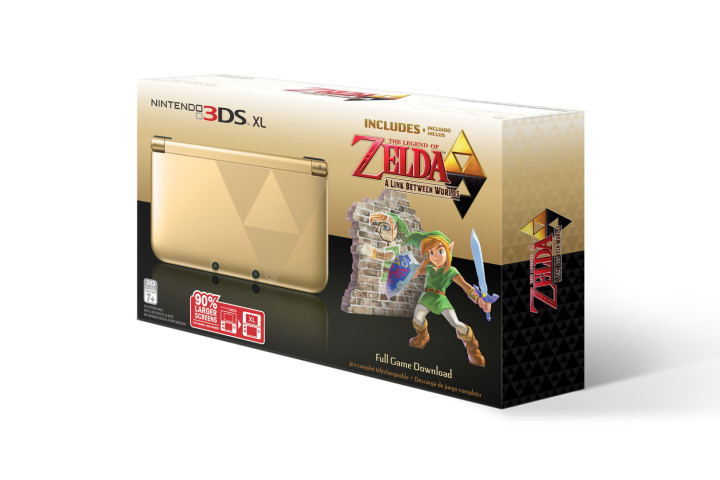 Will you be purchasing the Gold Zelda 3DS XL? Let us know in the comments below.